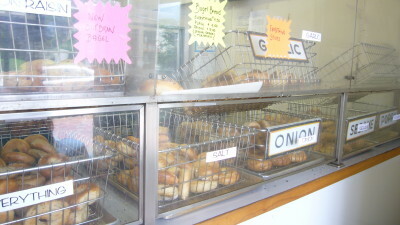 Sonny’s Bagels in South Orange, NJ is more an industrial kitchen than a store. 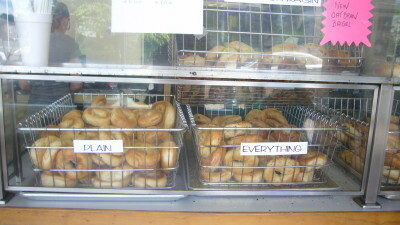 The commercial area is a simple slip of counter that supports an old cash register and nine or so metal mesh bins, stacked two high, into which warm bagels tumble all day long: Plain, Sesame, Poppy, Garlic, Onion, Salt, Cinnamon Raisin, Everything, and a dark, dense Pumpernickel. The menu is a simple piece of paper listing quantities of bagels and their cost. Beyond the counter are rows of stainless steel ovens and great vats of water into which the risen dough is plunged for boiling. There are stainless steel mixing bowls and flour-covered work tables. 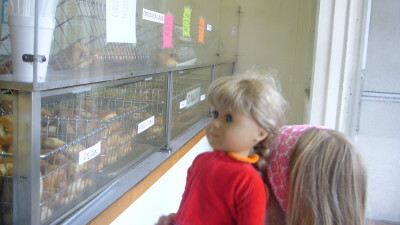 If you want a bagel, a friendly but no-nonsense employee waits impatiently for you to decide which, or how many pumpernickel or salt or just plain you will take today. Then, into the bag they go, so quickly it seems impossible she has counted them accurately. 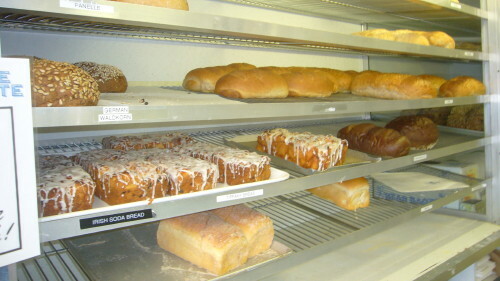 When I was a kid, if we arrived at a peak time, there was always a line stretching up South Orange Avenue, and we would wait for as long as it took for a brown paper bag full of a baker’s dozen, or a single bagel, still warm from the oven, wrapped in a square of pastry paper, and we would take our first bite before we had set foot out of the store, because a Watson bagel was that good. 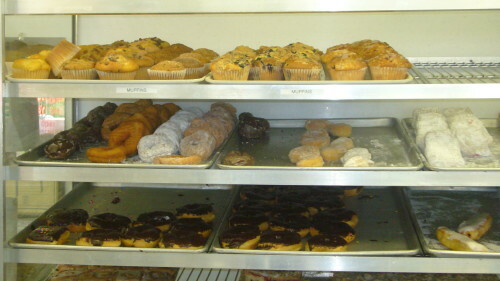 In the 1940’s, Watson’s Bagels, on Watson Avenue in Newark, served the booming Jewish population of the area. 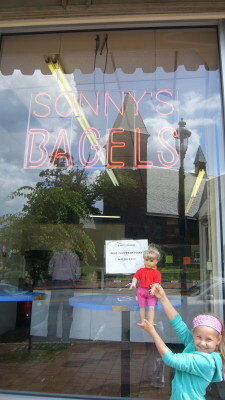 Sonny Amster learned to make the Watson bagel from his father, an immigrant bagel-maker, and he gained partnership in Watson’s in the late 1950s. At the time, the bagel making union restricted membership to those who had intimate knowledge of the process, and in this way ensured a de facto union membership comprised of bagel-makers and their sons. Race riots forced the Watson business to move location in 1967, but Sonny’s son expanded the business and opened his eponymous store in 1971, as well as others in neighboring suburbs. 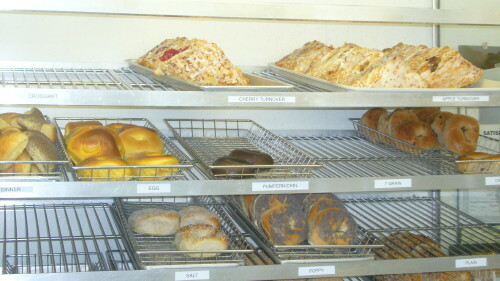 A Watson bagel is hand-rolled from dough made of high-gluten flour, salt, malt, and yeast. It is boiled then baked. Some attributed Sonny’s primacy to his brick ovens, others to the high quality and precise chemistry of the local water. (Decades later, my sister met a bagel maker in California who was rumored to import his water from the east coast.) 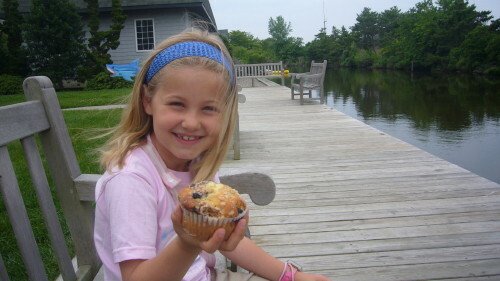 But for the child I was, the magic resided in the fact that hot, perfect bagels emerged from those giant ovens all day long—they were good and abundant. 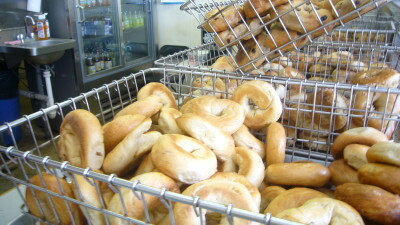 There was a time, at Watson’s, when hot bagels could be had 24 hours a day, and when I was a kid, Sonny’s bins were stocked with piles of bagels in every flavor my friends and I craved whenever we wanted, 7 days a week. 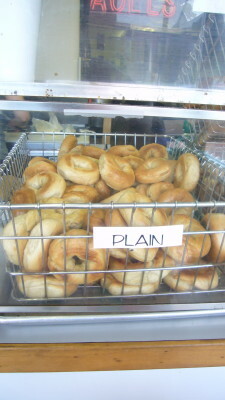 The bins were always full, or being filled, and there was something primordially satisfying about the simple fact of bagels, in plenty. In fact, Sonny’s still sells little else: a few bars of cream cheese, a few cartons of orange juice, milk, and cream for coffee. The reach-in refrigerator always appears half-empty. At Sonny’s there are no lox, no composed spreads, no butter as at other bagel stores; at Sonny’s there was nothing besides the bagel: crisp and tender on the outside, dense and chewy on the inside. Sonny’s old world beauty is probably not the product of a deliberate aesthetic, but in the end, it creates one. And for this, Sonny’s is still ritual, for Jews and gentiles and nonbelievers alike. When I was in middle school, if it was a lucky day, a short walk and 25 cents could procure my friends and me a bagel, piping hot and wrapped in that magic square of pastry paper. Then we were independent and worldly, partaking of something both familiar and famous, knowing we had gotten our hands onto something, onto one thing, that didn’t exist anywhere else, and it was exactly ours. What more, really, does an adolescent want? Our fingers warmed, our mouths filled with bread, for moment upon moment—over and over again—our hunger was sated. This trip, as always, we had bagels as many mornings as we could because there are many excellent food things where we live, bagels are (so very sadly) definitely not one of them. One morning, Finn and I were lucky enough to watch a fresh batch of bagels being pulled straight out of the oven. They went from peel to bin right in front of our eyes, and I plucked one for him, which he ate exactly as I had, with pure delight. Sonny’s is always our last, stop, too, on the way to the airport, so that we can load up our bags with a couple of dozen bagels to freeze. There is something crazy magical about arriving 3000 miles later, utterly travel weary, and then unearthing those bagels from the depths of the suitcase. 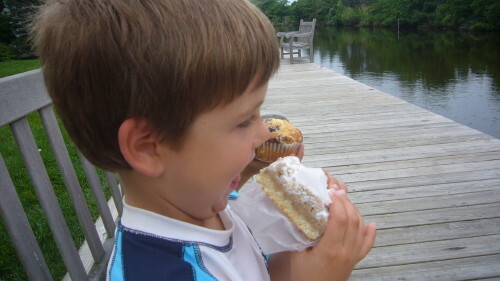 There’s the bounty to hoard, of course, but also the fact that our clothes smell like bagels, too, and in that moment, Sonny’s reveals itself, and the Avenue, and my teenage friends, and my family on Saturday mornings, and now, my son, with his mouth full, and his quiet, contented smile. Let’s have a little Feast! 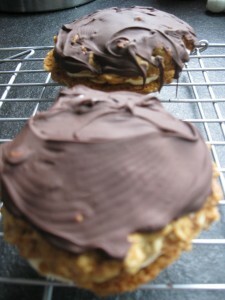 England is not generally known for its ice cream, and that’s ok — having contributed clotted cream (not to mention many fine cheeses) to civilization their dairy reputation is secure. 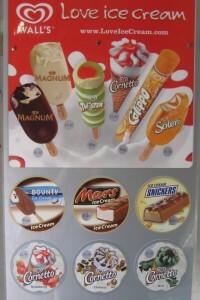 Still, as in Paris, there’s ice cream everywhere here. From trucks that dish up soft serve cones (and, for an extra 70p, how can you resist the addition of a nice chocolatey Flake bar?) 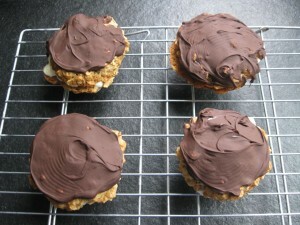 to corner store freezers with a fabulous assortment of frozen treats. 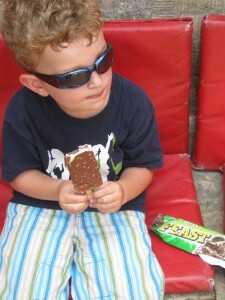 Meanwhile, after days of suggesting brightly (usually as a procrastinatory, “I don’t want to go into this museum” kind of tactic), “Let’s have a little feast!” Eli was delighted to find in Oxford an ice cream bar called Feast. He will never think of feasts the same way again. It isn’t the Cinque Terre, nor is it Venice, and it’s definitely not Paris, where Caroline & her gang are lucky enough to be on vacation, but Bay Head, NJ still has quiet, clean beaches, flanked by stately homes, canals, and Mueller’s Bakery— which has got to be one of the best small bakeries in the country. Our rental was just around the corner from Mueller’s, which we knew about thanks to my brother, who lives the next town over. 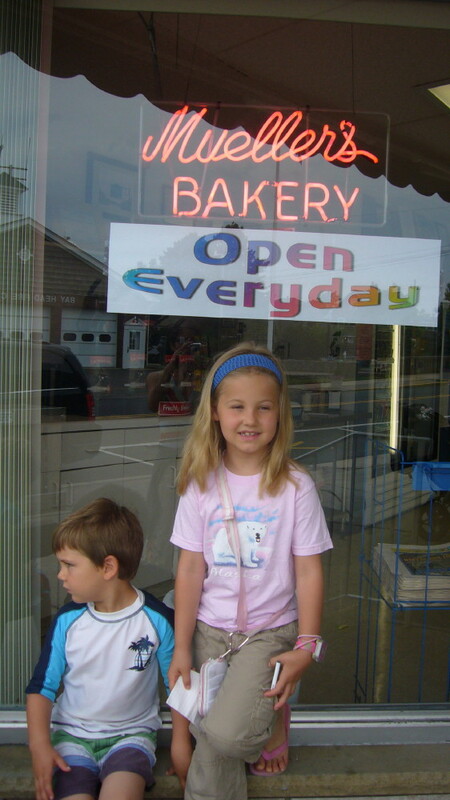 Every morning, the youngest girls would descend from their sleeping garret in the attic, find me and Finn in the second floor sunroom watching Cyberchase and drinking coffee, and we’d throw on our swimsuits and walk around the block to the bakery. 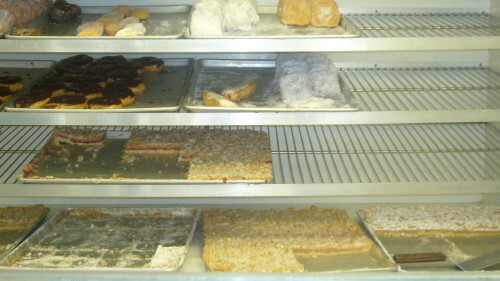 Inside was everything a butter-sugar-flour addict could dream of: the best jelly donuts I’ve had in 30 years–powdered and sugared both; chocolate donuts; powdered and glazed cake donuts; melt-in-your mouth apricot and berry danishes; bear claws; cheese claws; apple bars; turnovers; sweet pretzels; cinnamon rolls and twists; fresh bagels; fat muffins stuffed with blueberries; fancy cakes; everyday cakes; loaf breads and long breads–including sweet and savory varieties like Irish Soda; tray after tray of cookies, including decorated, themed ones as well as more traditional ones; cupcakes; and the major reason for my family’s swooning: the crumb cake–the recipe for which is unchanged since the Bakery’s inception over a century ago. Suffice to say the crumb cake has a dense, rich layer of incredibly moist cake, and an even richer, not-to-sweet thick layer of buttery crumb, topped with enough powdered sugar to lightly dust your shirt while you eat. They’re impossibly good, the Platonic ideal of a crumb cake, and if you’re craving one right now, Mueller’s ships them. Anywhere. We’d grab our cakes or donuts and cross the street and sit on a bench in front of the canal, where we’d unwrap the cakes and donuts from their waxed paper bags and eat, happily, while the morning woke up around us. 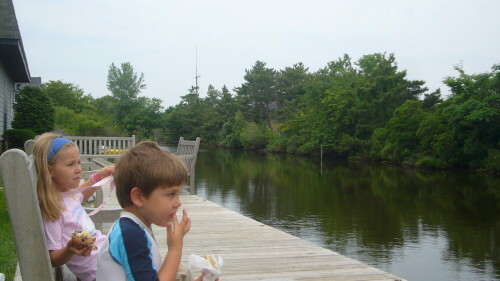 It was just like eating croissant on the Seine, Jersey Style. 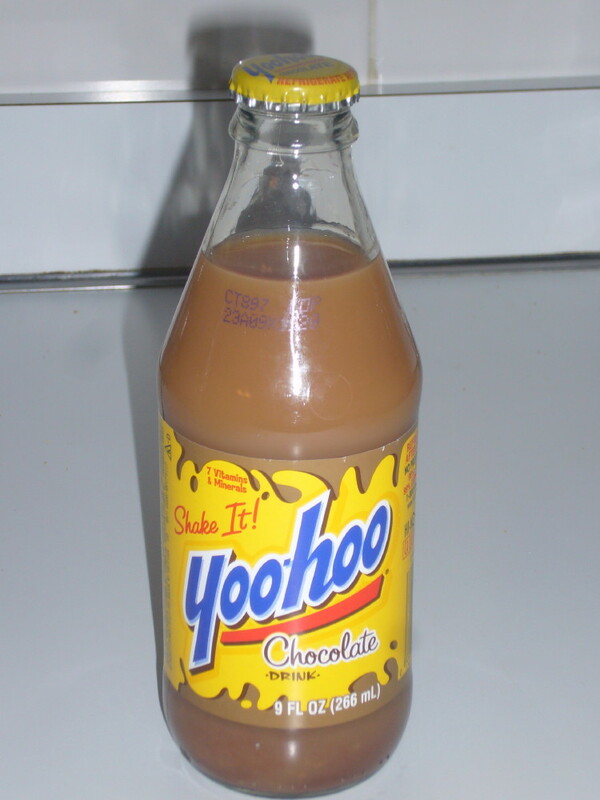 Only in NJ because we literally can’t buy Yoo-Hoo where we live, but also because, well, it’s so full of crap and so unhealthy and downright gross that I would never buy it if we weren’t on vacation. But buy it I did, and a six pack at that, for my son, and his sister and their 2 cousins, partly because I remembered it as a rare treat from my NJ childhood and because the packaging is still so iconic, and it’s sort of good and sweet and cold. Suffice to say Finn had a quintessential NJ food moment, sitting in one of the country premiere delicatessens, eating a bagel that had literally come straight out of the oven, and sucking down a Yoo-Hoo in maybe 60 seconds flat. But he can also do a mean dance to Rosalita. Both feats prove he’s my son.